The first thing you should do is bet your friends that you can make a safety pin float on water. When they say you’re crazy, just follow the simple steps below to prove them wrong. Surface tension is on your side, you just need to know how to use it. What to do: Fill the bowl with water. Then put the paper towel on top of the water and spread it out so that it’s flat. 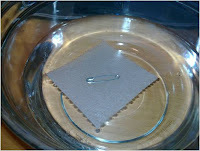 Next, carefully place the safety pin on the paper towel. Use the pencil or small stick to gently poke the paper towel until it sinks from beneath the safety pin. If you did this carefully enough, the pin should remain behind floating on top of the water. Amazing! How does it work? 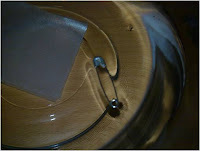 Even though the safety pin is more dense than water (which makes it want to sink), a force exists at the surface of the water, called surface tension. Surface tension is created by attraction of individual water molecules to each together. As long as some turbulence or vibrations do not disturb the surface tension, the pin will float. A water strider makes use of surface tension when it moves across the surface of a quiet pond. Its tiny mass and the geometry of its legs allow it to be supported by the high surface tension of the water. This activity is suitable for just about anyone who wants to try it, but it does require some care and a gentle touch. A teacher might be able to provide the biggest “wow factor” by first asking the class to try to get their safety pin to float on their own, and then showing them how to do it. Of course, a nice discussion of surface tension can follow. Thanks to Vinh Nguyen of U.T. Arlington for submitting this activity to DISCUS.